On this day in 1888, the first of 11 Whitechapel Murders occurred in London. 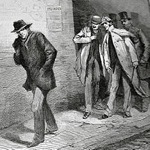 At least five such murders were eventually attributed to Jack the Ripper. Writing prompt: Write the scene of the first in a series of unsolved crimes your protagonist desperately wants to solve.